Book your preferred Golf clubs at the Golf shop at Malaga airport. The first store for sale and rent of accessories and equipment for golfing, existing at an airport in Spain just opened its doors at Malaga airport-Costa del Sol. The shop of the Irish company ‘Clubs to Hire’ is located in the Arrivals area, and there you can rent or buy everything you need for playing golf, from balls or tees to hats, shoes or bags of golf clubs. Malaga and the Costa del Sol is a very popular destination among golfers and due to its over 30 excellent golf courses the area is also is known as the Costa del Golf. Travellers can use the service `Clubs to Hire’ when traveling abroad. You thus avoid paying additional charges to airlines for excess baggage, since you only have to book your preferred set of clubs and pick them up at Malaga airport. With the rising cost of traveling with golf clubs on a plane, and some airlines having limited the number of golf bags allowed on board, no wonder that more and more golfers request this service. 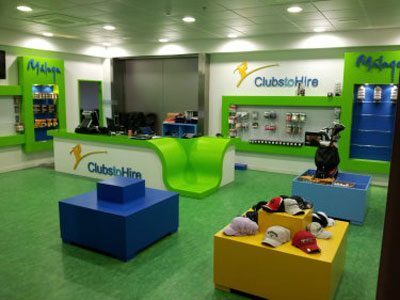 Clubs to Hire has 16 stores in and outside Spain, but not all offer the same possibilities of the Golf shop at Malaga airport, the first one in an airport in the Aena network airports. Hi, we’ve just come cross this blog post and would like to add our services to the mix. We’re based in Malaga and offer golf clubs to hire for visitors from all over the world. Take a look at our website – we love to help golfers (just like us) to enjoy the stunning Costa Del Sol courses. interested in buying electric caddy cart for use by lady, so looking for ultra light model. Can collect at airport. Please let me know price and availability. We are a car rental company at Malaga airport. Regarding your request I would recommend to contact directly the company “Clubs to hire” at Malaga airport. Their web page is http://www.clubstohire.com/Pages/shop_malaga and the direct telephone number is 0034 671 138 161.